I am currently selling 2.2oz containers of my personal mixture of floating pellets that best suit the nutrition of African Clawed Frogs. I have found over time that a balanced, varied, pelleted diet supplemented with live and frozen foods really is the best option for feeding frogs. My mixture has been formulated with different brands of floating pellets which all play a role in daily nutrition of an African Clawed Frog. Reptomin- fortified with vitamins, minerals and calcium to ensure balanced supplementation. ReptoTreat Suprema - Krill enrich floating food stick, great for color enhancement of reticulated and pigmented AFC. OmegaOne Kelp Pellets - enriched with veggie matter (yes, frogs need a percentage of plant matter in their diet) and fresh seafood. Main ingredients are Whole Kelp, Spirulina, Whole Salmon, Black Cod, Whole Herring, and a mix of seafoods including shrimp, muscles and squid. Sho Koi Optima - Contains ammune system boosters for added protection during times of stress. Preventative measure against illness and disease. Hikari Gold color enhancing cichlid pellet - Higher level of protein for the carnivorious nature of our ACF, plus natural color enhancers. This food darkens the pattern on reticulated albinos to deep shades of purple. Also enhances the shine of gold pigment in golden albinos. Hikari Turtle Sticks - this diet contains three pellet sticks in one. Although marketed for aquatic turtles, all the key ingredients play the same role in conditioning the dietary needs of ACF. Yellow stick: Staple nutrition stick contains the highest quality proteins, minerals and multi-vitamins to promote growth and help keep *African Clawed Frogs in peek condition. Green stick : Fortified calcium stick for improved bone structure and stregnth of growing frogs, and helps to prevent diseases caused by calcium defienciey. Red Stick : Conditioning stick which contains chitosan extracted from custraceans to activate the frog's metabolism and help keep them active during cooler months. Nutrafin Spirulina Sticks - formulated for vegetarian cichlids, also addes to the plant matter requirements in an ACF's diet. 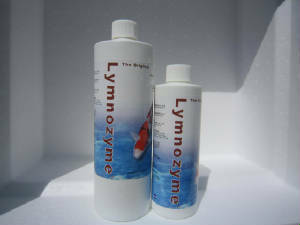 Nutrafin Gammarus Sticks - Gammarus is a freshwater shrimp that is a highly palatable source if lipids including Omega-3 fatty acids. Excelent addition to this mix of variety pellets. Freeze Dried Gammarus - Throughout the mixture of pellets I have mixed in freeze dried gammarus shrimps. This is a tasty treat which ACF love and can be easily consumed at the surface without creating much uneaten waste. Click on the "place an order" link below. The cost is $5.00 per 2.2 oz container. Shipping is $5.00 priority mail. Container lasts approx. 4-6 months depending on size, gender and age of frog. Included in order will be 2.2 oz container of In Depth African Clawed Frog Diet plus a bonus Feeding Guide and Seasonal Suggestions article! How to maintain your ACF through the different seasons is just as important as advanced nutrition. Did you know they don't need to eat as much, as often, in the cooler months? And what about in the summer with soaring temperatures? What you can do to protect your frog is all included at no extra charge. 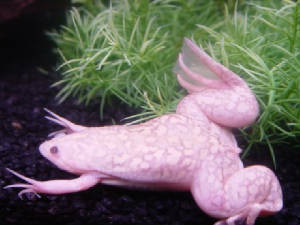 Give your beloved African Clawed Frog the most advanced nutrition you can find. This mixture has been formulated by me, and tested by my wonderful colony of ACF who have been glad to try out different types of diets and feeding regimines. In the past 4 years I have been using this diet and I have seen vast improvements in the overall wellbeing of my frogs. I have seen increased growth in adult frogs, color and pattern intensity, strong, robust muscles and skeletal structures, increase activity levels and healthy ammune systems. I swear by this mixture which is why I am how offering it to you! I have spent over $50.00 combining this unique mix of bulk pellets together. The convience of this perfect blend is only an email away. These photos are of my reticulated albino female, Bali. The first picture is when I had just obtained her. Her age is approximated at 6 months old. 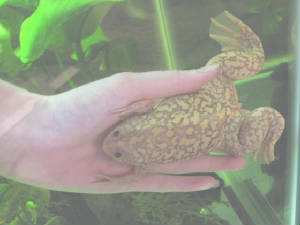 The following picture is her just two months later after feeding her my In Depth African Clawed Frog Diet. The intensity of her pattern and golden areas are a huge change from her first picture! These pictures are worth a thousands words when it comes to this special formulated diet. After being on this special diet for only 2 months! In Depth African Clawed Frog Diet is property of IDICACF (C) 2006 and can not be reproduced and marketed without permission.